The Sideways Glance. Princess Diana was beloved for it. A Coy way of revealing Interest and Playfulness! 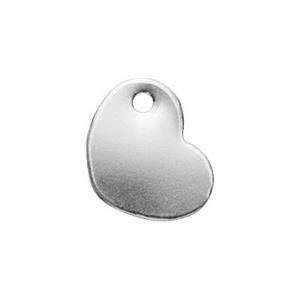 Our SL316T - Bright Sterling Silver 20 Gauge Sideways Small Heart Blank. A great way to generate some Teasing Playfulness with your Jewelry Designs! These have a 1mm inside diameter hole which will accommodate a 19 Gauge or Thinner Jump Ring. Stamp, or Engrave and Dangle from one of our many choices of Sterling Silver Footage Chains. Have been using these forever. Love them. I love this heart shaped blank, it's nice and heavy and always consistently uniform.